Today we’re looking at some fan-created art of Firestorm and Killer Frost! 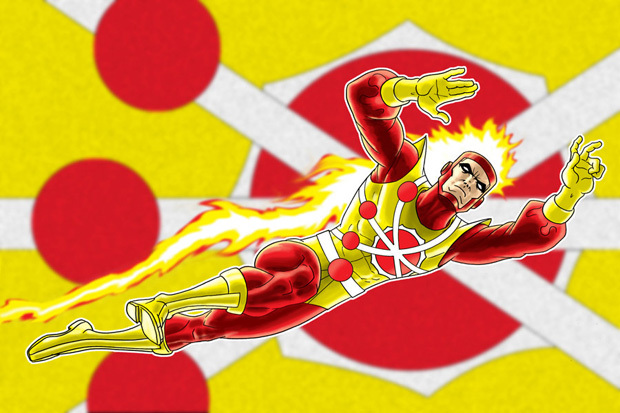 First up we have Firestorm by Terry Huddleston (Thuddleston on deviantART). Terry drew this Firestorm back in 2008. While I like this Firestorm, I’m even more impressed with his recent work. Terry has been doing a series of fantastic head-shots and full-body poses of various Marvel and DC characters. Click here for Terry’s DC head-shots and click here for his DC full-body poses. So cool! Next up we have Killer Frost by Alessandro (AlexMax on deviantART). I love the stylized look! This is actually just one section of a larger drawing featuring seven members of the Secret Society. Click here to see the entire piece also featuring: Clayface, Giganta, Gorilla Grodd, Deathstroke, Fatality, and Ocean Master. My thanks to Dan from the It’s a Dan’s World blog for leading me to Terry Huddleston’s work. My thanks to Frank Lee Delano for leading me to Alessandro’s work. Check out Frank’s Power of the Atom blog for a great Hawkman by Alessandro, then follow the links for four more cool pieces by the same artist! Finally, check out Once Upon a Geek today as I’ve got artwork of Doctor Fate by both Terry Huddleston and Alessandro! Support Firestorm (plus Thuddleston & AlexMax)! Fan the flame! Posted in: Firestorm #01: Original (Ronnie/Martin), Killer Frost, Sketch/Art. Thuddleston’s stuff is excellent. I bought a couple of trading card sized images from him a few years back at HeroesCon — The Flash and Luke Cage! Shag, since we seem to be building up to a new Killer Frost soon, I had an idea. If you and Rob are planning a podcast sometime before the next book comes out, maybe you could do an overview of the history of Killer Frost as a character? @Robert – Great idea! We might just do that!